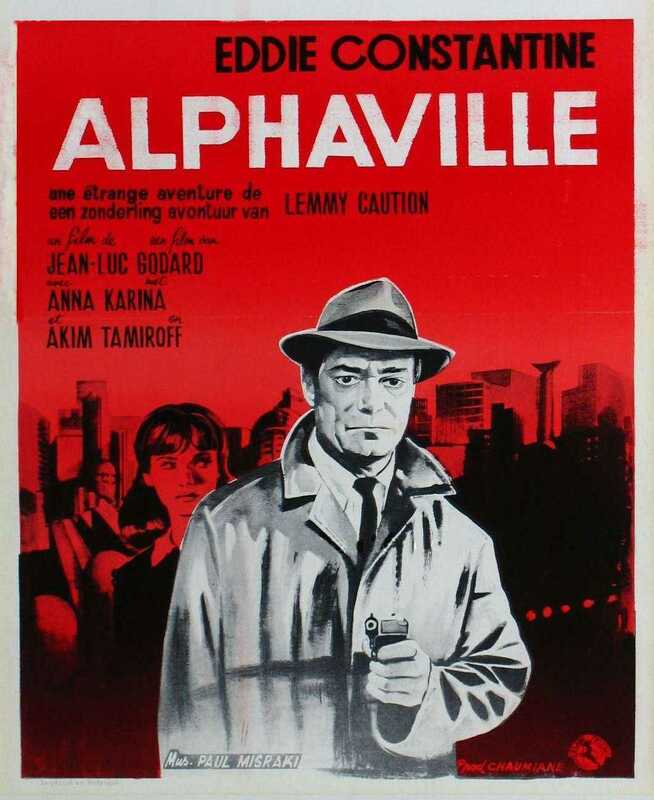 Alphaville: une étrange aventure de Lemmy Caution (Alphaville: A Strange Adventure of Lemmy Caution) is a 1965 French science fiction noir film directed by Jean-Luc Godard. It stars Eddie Constantine, Anna Karina, Howard Vernon and Akim Tamiroff. The film won the Golden Bear award of the 15th Berlin International Film Festival in 1965. 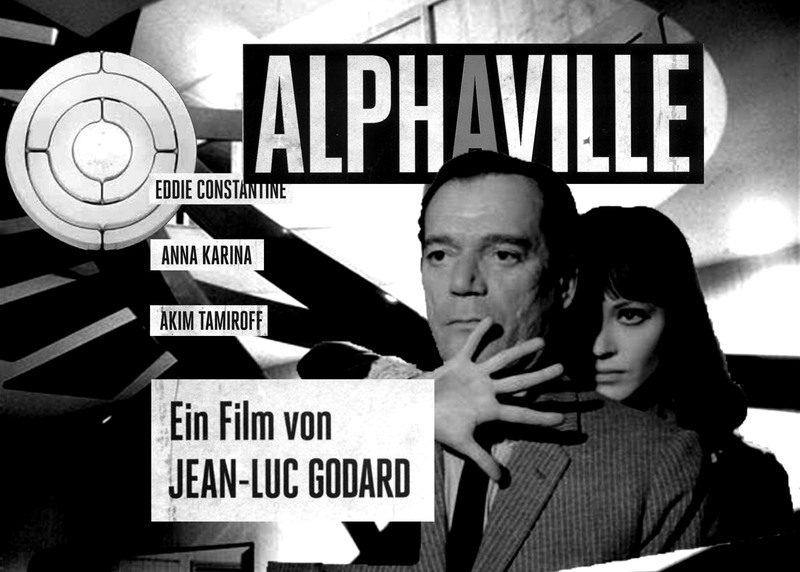 Alphaville combines the genres of dystopian science fiction and film noir. There are no special props or futuristic sets; instead, the film was shot in real locations in Paris, the night-time streets of the capital becoming the streets of Alphaville, while modernist glass and concrete buildings (that in 1965 were new and strange architectural designs) represent the city’s interiors. The film is set in the future but the characters also refer to twentieth century events; for example, the hero describes himself as a Guadalcanal veteran. Lemmy Caution is a secret agent with the code number of 003 from “the Outlands”. Entering Alphaville in his Ford Mustang, called a Ford Galaxie, he poses as a journalist named Ivan Johnson, and claims to work for the Figaro–Pravda. He wears a tan overcoat that stores various items such as an M1911A1 Colt Commander semi-automatic pistol. He carries a cheap Instamatic camera (new in 1965) with him and photographs everything he sees, particularly the things that would ordinarily be unimportant to a journalist. Caution is, in fact, on a series of missions. 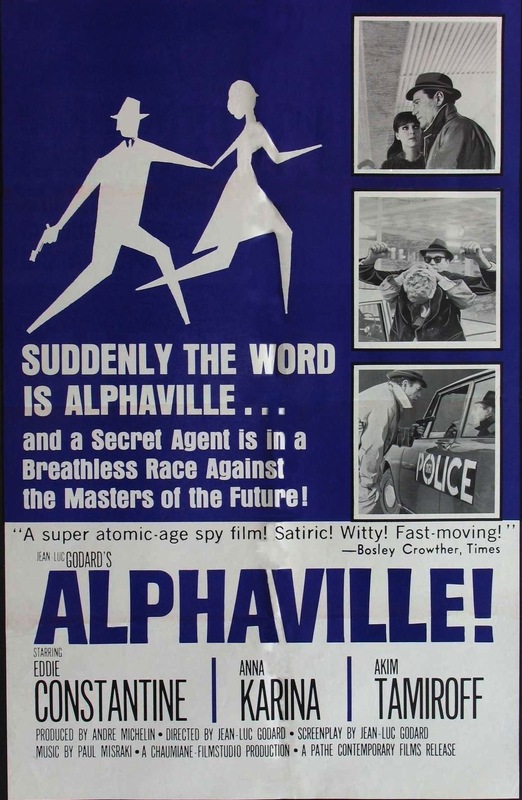 First, he searches for the missing agent Henri Dickson (Akim Tamiroff); second, he is to capture or kill the creator of Alphaville, Professor von Braun (Howard Vernon); lastly, he aims to destroy Alphaville and its dictatorial computer, Alpha 60. Alpha 60 is a sentient computer system created by von Braun which is in complete control of all of Alphaville. Alpha 60 has outlawed free thought and individualist concepts like love, poetry, and emotion in the city, replacing them with contradictory concepts or eliminating them altogether. One of Alpha 60’s dictates is that “people should not ask ‘why’, but only say ‘because’.” People who show signs of emotion (weeping at the death of a wife, or smiling) are presumed to be acting illogically, and are gathered up, interrogated, and executed. In an image reminiscent of George Orwell‘s concept of Newspeak, there is a dictionary in every hotel room that is continuously updated when words that are deemed to evoke emotion become banned. 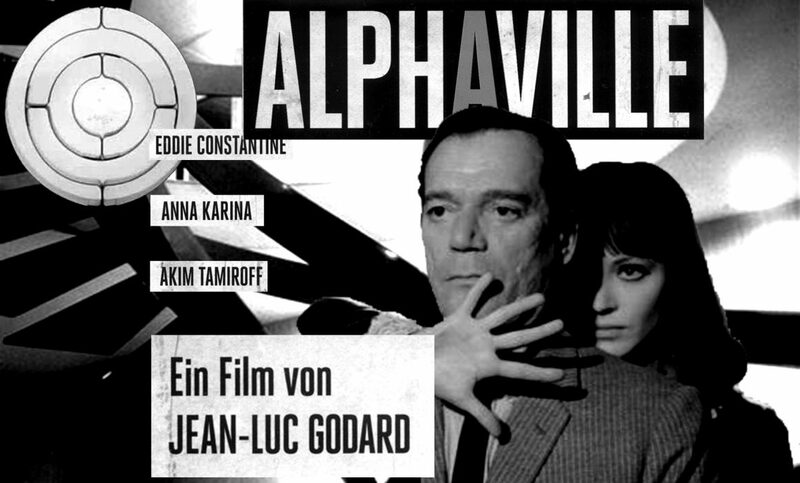 As a result, Alphaville is an inhuman, alienated society. Caution is told that men are killed at a ratio of fifty to every one woman executed. He also learns that Swedes, Germans and Americans assimilate well with Alphaville. Images of the E = mc² and E = hf equations are displayed several times throughout the film as symbols of the regime of logical science that rules Alphaville. At one point, Caution passes through a place called the Grand Omega Minus, from where brainwashed people are sent out to the other “galaxies” to start strikes, revolutions, family rows and student revolts. As an archetypal American anti-hero private eye in trench-coat and with weathered visage, Lemmy Caution’s old-fashioned machismo conflicts with the puritanical computer (Godard originally wanted to title the film Tarzan versus IBM). The opposition of his role to logic (and that of other dissidents to the regime) is represented by faux-quotations from Capitale de la douleur (Capital of Pain), a book of poems by Paul Éluard. Professor von Braun (the name is a reference to the German rocket scientist Wernher von Braun) was originally known as Leonard Nosferatu (a tribute to F. W. Murnau‘s film Nosferatu), but Caution is repeatedly told that Nosferatu no longer exists. The Professor himself talks infrequently, referring only vaguely to his hatred for journalists, and offering Caution the chance to join Alphaville, even going so far as to offer him the opportunity to rule a galaxy. When he refuses Caution’s offer to go back to “the outlands”, Caution kills him with a pistol shot. Alpha 60 converses with Lemmy Caution several times throughout the film, and its voice is seemingly ever-present in the city, serving as a sort of narrator. Caution eventually destroys or incapacitates it by telling it a riddle that involves something Alpha 60 can not comprehend: poetry (although many of Alpha 60’s lines are actually quotations from the Argentine poet Jorge Luis Borges; the opening line of the film, along with others, is an extract of Borges’s essay “Forms of a Legend” and other references throughout the movie are made by Alpha 60 to Borges’s “A New Refutation of Time“). The concept of the individual self has been lost to the collectivized citizens of Alphaville, and this is the key to Caution’s riddle. At the end, as Paul Misraki‘s musical score reaches its climax, Natacha realizes that it is her understanding of herself as an individual with desires that saves her, and destroys Alpha 60. The film ends with her line, “Je vous aime” (“I love you”).